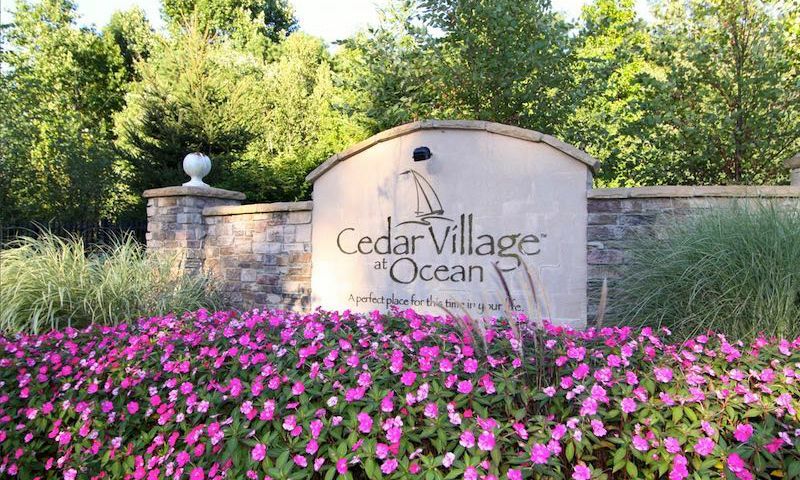 Cedar Village at Ocean in Ocean Township, New Jersey is a 55+ community offering its residents low-maintenance living. The community clubhouse provides homeowners with endless opportunities to stay active and social with neighbors and friends. Located in beautiful Monmouth County, the surrounding area offers a multitude of shopping, dining and entertainment options. A convenient location, excellent amenities and a low-maintenance lifestyle are just a few of the reasons why this community is great for today’s active adults. The clubhouse is the center of all amenities and activities in Cedar Village at Ocean. Here residents can gather in the multi-purpose room for game nights or work out in the fitness center. The clubhouse also features an indoor spa and saunas for relaxing after breaking a sweat. Residents can also explore their creative side with the arts and crafts studio, relax with a good book in the library or cook a meal for friends with the catering kitchen. Cedar Village at Ocean also provides a bar area and a billiards room for casual get togethers. Outside, residents can take a dip in the crisp pool or bask in the sun poolside. In addition, homeowners can meet with neighbors for a game on the tennis and bocce ball courts or practice their golf game on the putting green. The community’s low-maintenance lifestyle ensures that residents will be able to spend more time enjoying the fabulous amenities within Cedar Village at Ocean. Continental Properties developed Cedar Village at Ocean between 2005 and 2014 and is comprised of 295 single-family homes. Five floor plans are within the community that range in size from 1,500 to 2,417 square feet. These homes feature two or three bedrooms, two or two-and-a-half bathrooms and a two-car garage. Each home is designed with active adults in mind with first-floor master suites, spacious kitchens and open floor plans. Although there is no activities director in the community, residents of Cedar Village at Ocean have developed a thriving social scene. Card clubs, discussion groups, and holiday parties are just a few of the options for residents to enjoy each others' company and meet new neighbors. Cedar Village at Ocean also provides residents with diverse events like holiday parties, Italian soup night, and Zumba and stretch classes. Cedar Village at Ocean offers its residents great low-maintenance living. A homeowners' association fee covers the maintenance of the clubhouse and common grounds. This lifestyle lets homeowners enjoy this great community instead of being burdened with tedious chores. Cedar Village at Ocean is located in Monmouth County’s desirable Ocean Township, New Jersey. Monmouth County offers more than 50 miles of beaches, historic sites, parks, golf courses, dining experiences for all tastes and plenty of places to spend the night. In addition, New York and Atlantic City are perfect weekend getaways and offer limitless entertainment. With four distinct seasons, Central New Jersey offers scenic beauty year-round. Active adults in Monmouth County, New Jersey will love the amenities and friendly neighborhood at Cedar Village at Ocean. There are plenty of activities available in Cedar Village at Ocean. Here is a sample of some of the clubs, activities and classes offered here. Continental Properties developed Cedar Village at Ocean between 2005 and 2014 and is now comprised of 295 single-family homes. Five floor plans are found within the community that range in size from 1,500 to 2,417 square feet. These homes feature two or three bedrooms, two or two-and-a-half bathrooms and a two-car garage. Each home is designed with active adults in mind with first-floor master suites, spacious kitchens and open floor plans. Please Note: Not all floor plans are available at this time. Cedar Village is a nice little neighborhood. We moved in last summer and quickly started getting to know our neighbors. The people here are friendly and the clubhouse is great. The prices are pretty reasonable and the quality of the homes is very good. 55places.com is not affiliated with the developer(s) or homeowners association of Cedar Village at Ocean. The information you submit is distributed to a 55places.com Partner Agent, who is a licensed real estate agent. The information regarding Cedar Village at Ocean has not been verified or approved by the developer or homeowners association. Please verify all information prior to purchasing. 55places.com is not responsible for any errors regarding the information displayed on this website.